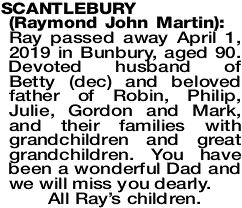 Ray passed away April 1, 2019 in Bunbury, aged 90. Devoted husband of Betty (dec) and beloved father of Robin, Philip, Julie, Gordon and Mark, and their families with grandchildren and great grandchildren. You have been a wonderful Dad and we will miss you dearly. The Funeral Service for the Late Mr Raymond (Ray) Scantlebury of Donnybrook will take place at the Bunbury Crematorium Chapel, Hales Street, BUNBURY on MONDAY (8.4.2019) at 2.00pm.